Welcome to Frugal Photo Friday! This month, I am partnering with Rebekah from . Each Friday we are sharing pictures of simple ways that we save money. One way we save money is by stretching our taco meat. We use this meat in tacos and Haystacks. I brown two to three pounds of ground beef with 1-2 chopped onions. Then, I add in homemade taco seasoning mix (or just taco seasonings). After that, I add in some 2-4 cups beans (most any kind will work — and you can use canned or home-cooked beans) and 1 can of diced tomatoes (or diced fresh tomatoes). I cook this mixture through and it’s ready to serve or cool and freeze. The extra add-ins add some bulk and flavor and add at least the equivalent of an extra pound of ground beef. My family doesn’t even know most people eat taco meat without add-ins since we’ve been doing this all our married lives! Now it is your turn to share the simple ways that you save. Post your link below or on and using the hashtag #FrugalPhotoFriday. All of the link-up details can be found . Frugal Photo Friday (on Monday! ): Anything Goes! Some people from Mexico will add grated potato- it seems not to alter the flavor as much as beans (for those that don’t like beans). Yup, we add beans too! In fact, we prefer it with beans as compared to “regular” taco meat. Jenny, I’m intrigued with the potato idea. Might have to try that as well as the diced tomatoes that you suggested Crystal. This is very intriguing. Would you add raw grated potato? or grate it and cook it first? Any idea on ratio for a pound of ground beef? Yes! I add a grated (raw) sweet potato and it blends in beautifully. No one ever knows! Yep! My husband grew up in Mexico. With 6 kids, his mom stretched their ground beef with cubed potatoes. They cook the potatoes some in the skillet first, add and brown the beef and then simmer in a home made salsa (tomatoes, onion, garlic and a pinch of ground cumin in the blender). YUMMY on toastadas! We do this too! We also add corn, green peppers, and sometimes green chilis. So good and good for you! I usually add cooked lentils. DS does not complain about the different texture as he does with beans. We use lentils as well. I also use lentils in sloppy Joe mix and sometimes in casseroles. Such a frugal meat stretcher! Here’s a really simple trick that really works (I learned this when serving tacos to a large crowd) — START WITH LETTUCE! People tend to load up on extra taco meat because they want to fill the taco shell. By starting with lettuce, tomato, onion, bell pepper THEN meat, cheese and sour cream, it really makes a huge difference! We do this at home and always have plenty of leftovers for the next day. We currently have no income coming in until the government shut down is resolved so have been desperate about ways to not spend money. Thanks again! Lentils are great for thinning ground beef in spicy recipes! I add lentils to Sloppy Joes…half hamburger half lentils, my grandkids call them grandma hamburgers and love them. I also add white beans to chicken when I make chicken enchiladas. 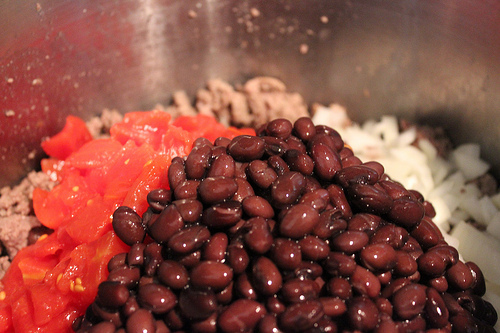 If your family doesn’t like the texture of beans, try grinding the in the food processor before adding to the meat. I also do this with chili and other soups. my mom always did this growing up and I had no idea!! I can’t believe I have never thought to do this! 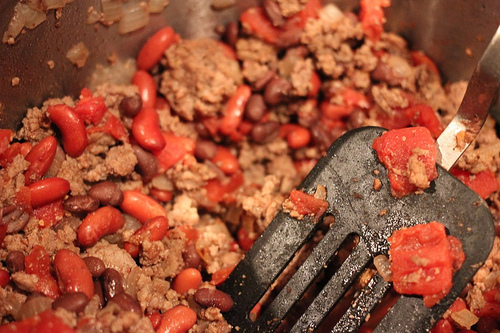 Adding beans would be such an easy and filling way to make the meat stretch further. I have heard of adding potatoes and onions too. I will have to try this, I sure it is just delicious too! We add beans too so it will make more. Never thought of making a bigger batch and freezing it. Brilliant! I had never thought of doing this! I’m going to start as soon as we go grocery shopping! And it is ok to make this ahead and of time and freeze it correct? Thanks for this idea. I was just bemoaning the cost of ground beef and the quality of what I’m getting at the grocery store. It’s a great week if I can find it for $3.49 a pound here in New England. And I hate buying less than 90 percent lean, it is so greasy. You can put fattier meat in a strainer after it is browned and rinse it with hot water. It really improves the taste. I did this a lot when we had a house full of kids at home. Love it…I wish I had thought of this. I would totally be able to get a second meal out of 1 lb of ground beef and be able to freeze it. Thank you!! ADD OATS. Before the meat cooks. No joke. Regular or instant, you can add oats up to just under a 1:1 ratio. The oats will soak up some of the excess fat as well as seasonings and taste just like the beef, with the benefit of added fiber. Yes! I’ve added uncooked oats to ground meat with great results. Experiment with how much oatmeal you can add before…you know…they know. 😉 I think about 1/4 cup to a pound of meat was my husband’s limit. Also, I would say to experiment with the type of beans you add, if you go that route. I am allergic to nearly all beans (black, pinto, kidney, etc…and, unfortunately, peanut butter!) but can eat great white northern. Go figure. I will occasionally section out a portion for me and then make the rest of the meal with beans I can’t eat so my family can have a bit more of variety. When add-ins are too big for the family, I throw them in the vitamix first, but I used to use the regular blender or stick blender or food processor and just make em tiny and feed them to the family anyway. It’s what I cook or a bowl of cereal or be hungry – you decide. If your family members can’t/won’t eat those add-ins and making them very small doesn’t work, try exploring other add-in options. A few people mentioned lentils or uncooked oats. Another great one is bread or cracker crumbs. You can also mix ground beef with ground turkey and, as long as you keep a good ratio, it tastes about the same. Of course, that’s not as cheap as beans or bread crumbs, but it does mean you can use slightly fattier ground beef and it’s a bit healthier overall. This is SUCH a good idea. 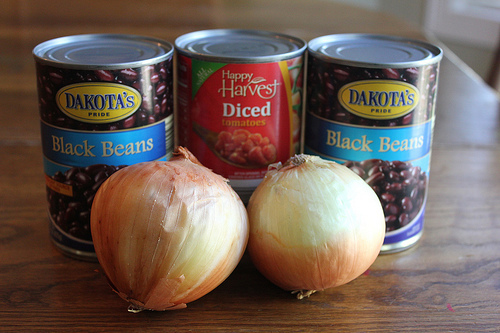 I always have added onions, but I never thought about adding beans. I’m not a fan of beans – I don’t like the texture. I do occasionally soak them and then boil them a little too long so they get mushy and then blend them into paste. 🙂 Might be worth it especially if I did a double batch so I could freeze some for next time. I never thought to add that to my tacos. Usually I add beans to my burritos to fill them up. I’ll have to see what my hubby thinks! Never tried this. It seems more like “chili” to me. 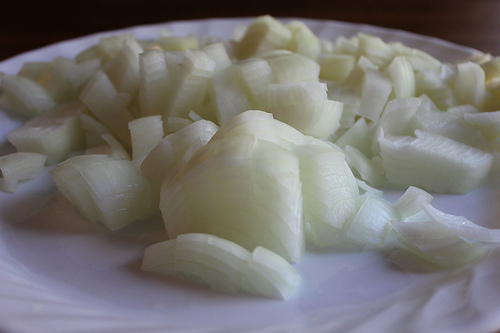 One thing you can do to make it go further- though it is less healthy is to add som cracker or bread crumbs to the meat, add a little bit of moisture (you could use water, ketchup, tomato sauce, etc) as well as some dices onions, peppers, etc. Somewhat like a meatloaf mixture and it will add about 50% to your meat. You could use more, but it starts tasting more like your “filler” item than meat. I’ve had taco meat with tiny diced potato and carrot, it was delicious and usually things you have right in your refrigerator! We always seem to need 1 lb of meat to fill us up -this would be a great way for us to be able to cut back. Thanks for hosting Frugal Photo Friday. I also stretch mine with rice. If I have leftover rice I throw that in, but sometimes I will make up a cup of instant and mix it in with the ground beef. Brown beef, when it is almost cooked, add the onion, sauté until translucent, add zucchini, as it starts to soften, add beans. Cover and cook until zucchini softens. Tip pan to collect “juices,” if you have enough add taco seasoning 1-3 T (to taste) and make a sauce (if you don’t have enough juice add water or broth. Once sauce is made, mix it into the rest of the mixture and cook for another 5 mins or so. What a great (and creative!) tip. Thanks for sharing! Yep this is what I do to! Zucchini or yellow squash in taco meat, dirty rice & sloppy joes. I add eggplant to spaghetti or anything used for Italian meals. Nice thing is if you have a fruit stand nearby, you can get the almost too old stuff of the $1 table and do this for next to nothing. Your kids get veggies too!!! I never use more than 1 lb. of ground meat for my family of 5, and that’s feeding 3 teenagers (2 boys!!!). I started doing this the year my husband didn’t get a deer. His dad got two and shared part of one with us and part with my brother-in-law who also didn’t get one, so I really had to make it last. Unfortunately, I have gotten so used to doing this that I have too much venison left in my freezer by the time hunting season comes again! This is basically the taco soup that I make in the crockpot but I also add in corn. If you drain the cans, it’s not soup-y. But it could make great soup, too, if you added in some more liquid. My kiddos will not eat beans, but I buy TVP, or textured vegetable protein, which is soy-based, low fat and low carb. I soak 1/2 cup with 1/2 cup water and heat in microwave for 1 minute. Then mix in with taco mixture and seasoning until heated up. I use 1/2 cup because I only cook about 1 to 1 1/2 pounds of ground beef. If you are making 2-3 pounds of meat, use 1 cup of the TVP and 1 cup water. We don’t use any meat in tacos, we just substitute lentils. The taste and texture is very similar to ground beef and it is much cheaper and healthier! We don’t use any meat. Saves a ton of money and is much much healthier. Even in spaghetti, I just add a cup of cooked red lentils. Eat it or be hungry! We also add in diced bell peppers – when they’re fresh from the garden or cheap. Not all of my kiddos like all the add ins but you’re right, it makes the meat go much further! That is a great idea. I will try it next week. We usually add just a can of refried beans to stretch the meat. Can’t wait to try this. We always have refried beans with our taco salad. For a family of three (basically 3 adult portions) we have about 1/3 lb beef and 1 can refried beans. We eat grass fed beef which costs more but this way it goes further. I find as a whole, grass fed meat is more filling, less fatty and less watery so it takes less to make a portion. I recently cooked a 4 lb. grass fed chuck roast that made 6 meals for three people for a total of 18 portions! I also add cooked lentils. Even my pickier son doesn’t seem to notice they’re there and they add fiber. Also, I always add corn because I love it! It’s amazing how the meat starts out as such a small amount and by the time I’m done, the pan is FULL and full of nutrition! I do a similar thing with my meat sauce. I add loads of mushrooms that I dice really small so no one notices and I also add lentils. By the way, I add canned pumpkin to add nutrition and thicken my sauce. No one notices it, but I know they’re getting loads of vitamins! Beans, onions and tomatoes, yep! We add in liver which is usually cheaper than quality ground beef. A can of tomato sauce or paste helps blend things together. Corn and rice too, depending on what dish I’m making. I almost always serve tacos as taco salad. I can throw in more veggies and you start out with a plate full of lettuce and spinach. We are a family of 6 on a very limited grocery budget, so in addition to the fabulous idea in this post about adding beans (which truly is a nutritious filler), there is another idea that can help you stretch your meat even further. I purchase 1.5 lbs of beef, cook beans, cook rice, and then use this on top of a bed of lettuce to make taco salad. With the toppings, it is very filling and I can stretch it to make TWO meals for 6 of us. The lettuce bulks it up and a tortillas on the side works great. Salsa, cheese, sour cream, avacado help build it up even more. It’s one of our favorites.